Complete the perfect equation for student understanding with this fun chemistry concept activity. 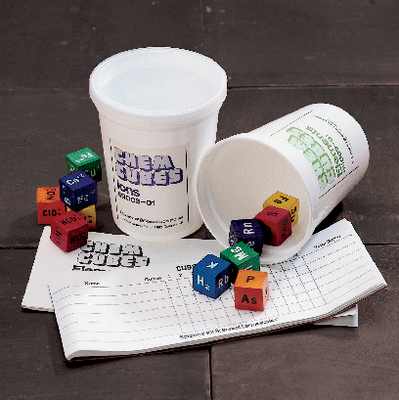 Divided into two categories, an eight-game series called Elements and a nine-game series called Ions, Chem-Cubes are an effective method of lesson reinforcement and review. In the Elements game, students learn element names and symbols, atomic structure, proper use of the periodic table, valence or oxidation numbers, and simple chemical reactions. In Ions, the focus is on names and formulas of simple ions, radicals and compounds, and how to write balanced equations.